Long Island Restaurant News | Catch the FIFA World Cup at These Long Island Hot Spots! As thirty-two teams across the world compete for the title of world’s best soccer team, restaurants across Long Island will be showing the games in full glory! For a dose of team spirit (not to mention some mouthwatering drinks and bites), catch the games at these awesome hotspots. Olé! Rowdy Hall, which has been a popular viewing spot for soccer fans for the past several World Cups, takes the party outside with a big screen TV in the courtyard for optimal viewing for large crowds. Grab a beer at the bar and head outside to watch the action. Rowdy will show the 11 a.m. and 2 p.m. games, as well as the 10 a.m. games starting with the top 16 round. Why watch the games on one TV when you can watch them on eight? The Springs Tavern will be showing the games on multiple TVs throughout the restaurant while giving prizes given away. Don't forget $5 Heineken and Heineken Light bottles! If you love BBQ, head to Townline BBQ and catch the games on the 6 large screen HD TVs throughout the restaurant while enjoying some chicken and ribs. Townline will be showing all of the 11 a.m. and 2 p.m. games, as well as the 10 a.m. games starting with the round of top 16. Watch, cheer, and enjoy a Stoli Moscow Mule special during the 11 a.m. and 2 p.m. games. Out in Montauk, check out the games with a water view at Navy Beach! The bar at Navy Beach will open early for 10 a.m. and 11 a.m. games and feature drink specials on mimosas and Bloody Marys. Over at Indian Wells Tavern in Amagansett, grab a seat at the bar and catch the action on the 5 flat screen TVs. Make it a game to remember and order off the bar menu for snacks, cocktails, and other mouthwatering treats. With wall-to-wall screens, you won’t miss a moment of the action at this famous sports bar chain. Enjoy the game, cheer on your favorite teams, and don’t forget to enjoy delicious drink and food specials for added team spirit. We can’t blame you for not wanting to miss a single moment of the World Cup. Thankfully, Plattduetsche Park is here for all the true soccer devotees! This historic eatery and beer garden will be open for all the games while serving their trademark authentic German fare and plenty of drinks. Cheers! 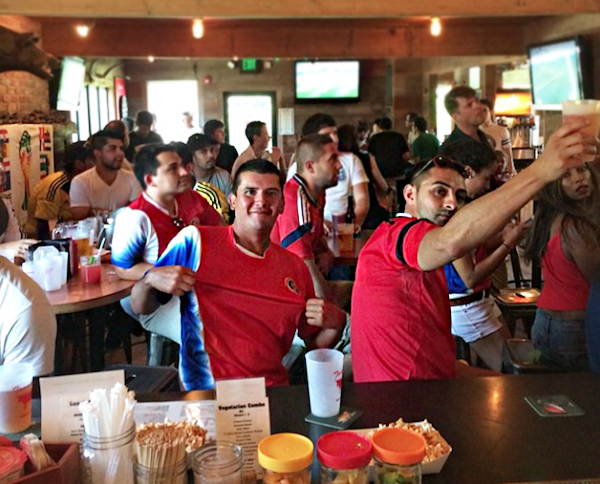 Garden City soccer fans can look forward to catching the games at Prost Grill and Garten. This popular European eatery will be showing the games on several big screens, plus all the burgers, beers and brews you could ever dream of. Talk about a good time!